If you don't have enough space on your PC anymore and you don't want to spend money (yet) on a new harddrive, try cleaning up your Windows directory. Windows has a lot of junk that you would probably never use, so why not delete it. Warning: Be careful what you do. The folders where you'll be cleaning up are indeed part of Windows. These tips will only show which files and folders you can delete without touching the core files of Windows. Deleting any files is at your own risk. This has been tested on Windows XP Pro Final and SP1 (Not home, but it should work fine) Windows 2003 Enterprise Server 3700, RTM, and The Free Evaluation version (Any 2k3 version should work fine), and Windows 2000 Pro. If the following folders are not on your 2k/2k3 system it means they are only in XP and you don’t need to worry about them. If you can't delete the whole folder, just delete the files inside. All the paths are C:\Windows and C:\Program Files, if your folders have different names (Like C:\WINNT on windows 2k) then you should use that path instead. Now let's get started with deleting files and cleaing up your Windows folder. *NOTE*: Don't delete this folder, only the files inside. This folder uses a LOT of hard drive space, it holds a backup of every system file that windows uses. Deleting this will cause a SFC error when you replace a system file instead of windows putting back the original file. For people who want to mod their system, this is a good thing. This folder only exists if you installed a service pack on XP, if you did a slipstream it won’t be here either. This folder is the same as the dllcache, but has the new files that were updated by a service pack. If you delete the dllcache, deleting this is just like finishing the job. This folder contains some custom cursers for windows, if you are happy with the default cursers, or use your own set, then deleting this wont effect you at all. This is one you may not want to delete, this takes up a bit of space (about 80mb) but windows uses if you ever add or remove windows components and things like printer drivers. If you’re your hardware is already working fine, you don’t need this folder on your hard drive. For example, if you delete this folder, and try to install IIS, windows will ask for the CD or Network share with the files on it, if you don’t need to add or remove windows components often, deleting this will free up some space for you. This folder contains all of the windows help files. If you are like me, and think they having 50mb of help files is a waste, then you probably want to delete it. If you delete this folder and try to view a help file, the Help and Support center will come up with a 404 error. No harm is done, you just can’t view the help files (because you deleted them…). There is also a tours folder inside of the help folder, you can delete everything in this folder also, but windows won’t let you remove the actual folder. This folder contains a lot of windows drivers, if you ever add new hardware, windows looks in this folder, then on your CD drive for the latest drivers. Any hardware you might get will probably come with the drivers on a disk, so this folder is just a wasting space on your hard drive with outdated drivers. If all of your hardware is working fine, and you don’t plan on adding any new hardware for a while, deleting this wont effect your system at all. If you don’t want to delete everything in it, you can go into the folder, press CRTL+F and search for mdm*. * and delete everything that comes up. These are all modem drivers, and it is very unlikely you will ever need them because you either have a modem installed already, or if you do add one, it will come with newer drivers. WARNING: Some people have reported problems with this, and have not been able to search, try this at your own risk!!! This folder holds the installers for some programs you download and install, for example, Tweak UI puts its installer in this folder, and so you can repair it or update its components later. Deleting this folder won’t harm any programs I have ever seen, but you should look inside this and see what you are deleting first. These are the default windows sounds, if you don’t want them, deleting them wont hurt anything. These are the MSN Explorer and Net Meeting applications. If you don’t need or use them, then you can delete these folders (For net meeting, you can only delete the files inside) and the only thing it will effect is that these programs will no longer work. In this folder is the Out of Box Experience (The screens you see right after you have installed XP for the first time), and the XP Product Activation stuff. If you have a Retail or OEM version of XP, and you think you might ever need to activate again, DON’T DELETE THIS. So unless you are using XP or 2k3 CORP, you may still need this folder someday. This is the crappy MS Java components that don’t work well, and MS got sued over. 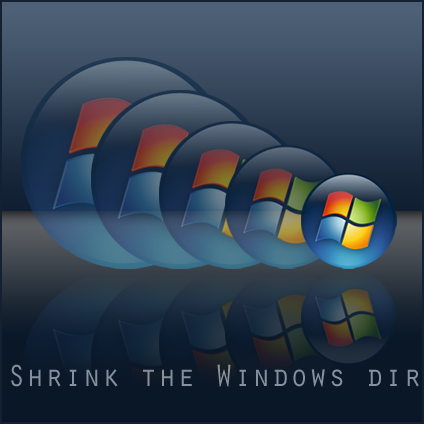 If you have Windows XP slipstreamed with SP1a you wont have this because MS no longer distributes it. If you use websites that use Java Applets, you should keep this, or remove it and install Suns Java VM. This is a little app that allows you to switch between multiple languages, if you only use one language, then deleting this wont effect you at all. NOTE: I think this folder only exists on XP Pro because Home Edition doesn’t support multiple languages. After you have deleted everything you want to, I recommend you run the Registry Cleaner from jvPowerTools. This will remove all the references to things you deleted so a window doesn’t look for the files any more. If you delete the Java Folder, RegCleaner will find at least 50 reg entries related to it, and can remove them for you if you want. That's it, if you know more folders that you can delete without any problems, feel free to post them in the comments. You instruct to compress everything except for exe and dll files. One easy way to accomplish this is to do a search in the windows directory for *. * After the search is complete, organize the files by type. Files with the type "Application" are exes, and next in the list are dll files labeled "Application Extension". With the list sorted in this manner, it is easy to click just after the dll files, and then shift click at the end to select all non exe files. Then apply compression via the properties menu.